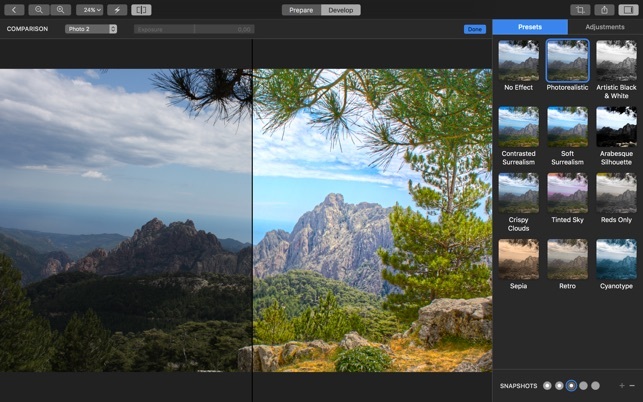 Hydra lets you create beautiful high-dynamic-range (HDR) images by merging multiple exposures, effectively capturing both dark and bright subjects to make it more natural or to enhance scene drama. A single photo cannot represent the entire dynamic range of light in a scene due to the physical limitations of the sensor. The picture is either too dark or too bright, or both. 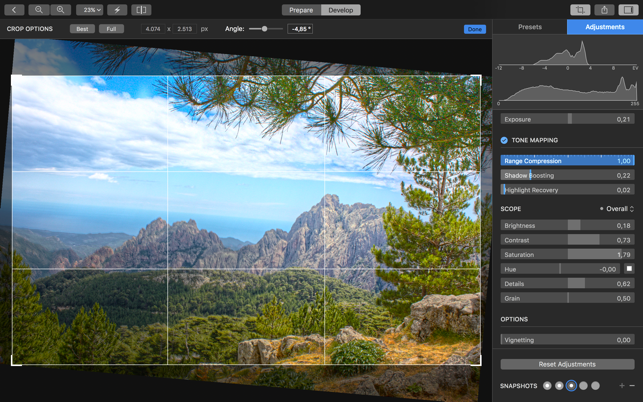 Hydra allows you to overcome this limitation by merging a number of photos with different exposure settings and to create a natural image that is much closer to what your eyes actually see. Alternatively, Hydra can also artistically push contrasts to increase drama and emotions in your pictures beyond reality. This new release of Hydra has been optimized for latest macOS enhancements and it provides native Metal support with maximum performance, in addition to a more modern and simpler user interface. - Elegant and easy-to-use translucent user interface. - Automatic or manual image alignment with high-precision live positioning and fine-tuning. - Manual removal of ghosting artefacts using region delineation tool and per-region output contribution. - High-precision 128-bit internal format. 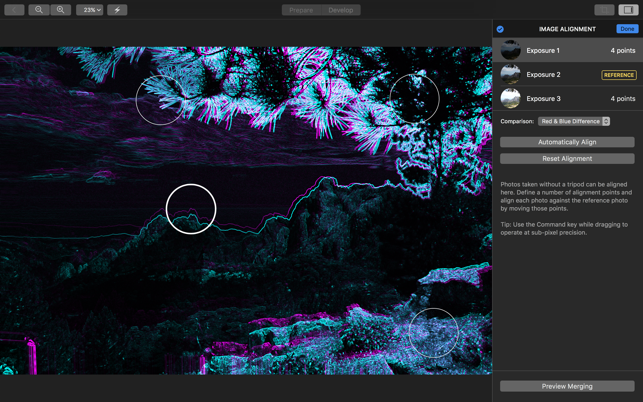 - Much improved tone mapping including presets, and live, full-resolution preview. - Advanced comparison tool of result against original pictures. 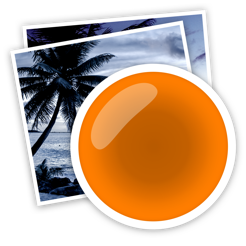 - Single or multiple input photos of various formats (JPEG, RAW, HDR, EXR). - Blazingly fast rendering to various output file types (JPG, TIFF, HDR, EXR) and color spaces (sRGB, Pro Photo, AdobeRGB…). - Accurate color processing, including support for Deep & Wide Color displays (30-bit, DCI-P3 display of latest iMac 27’). 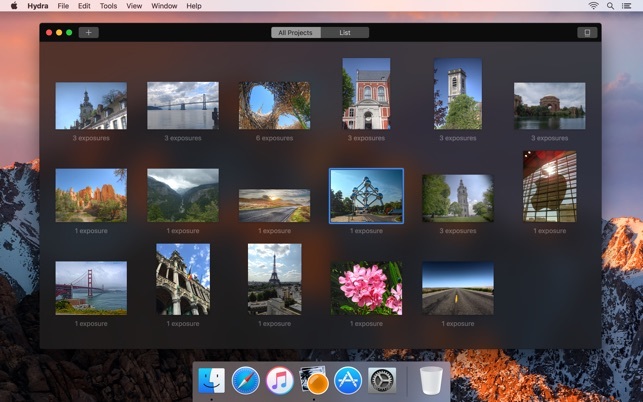 - Integration with Apple Photos app (input / output). Credits: World Scenery Photography by Sébastien Degardin, London. - Optimized for macOS 10.14 Mojave. - Improved support for dark theme & accent color. Accent color now effective throughout the app, in particular ghost selection & various buttons. - Fixed 32-bit rendering on discrete GPUs that could output black image when tone mapping was not applied. I had great expectations for this application and unfortunatly after trying all sorts of things (some recommended by the developer), I cannot get this application to recognize any pictures from my SLR cameras. The only pictures that come into the work area are ones from my iPad or iPhone. All other pitures import as a black screen with no data attached. The developer web site is very poor and recommendations for picture converters don not work. 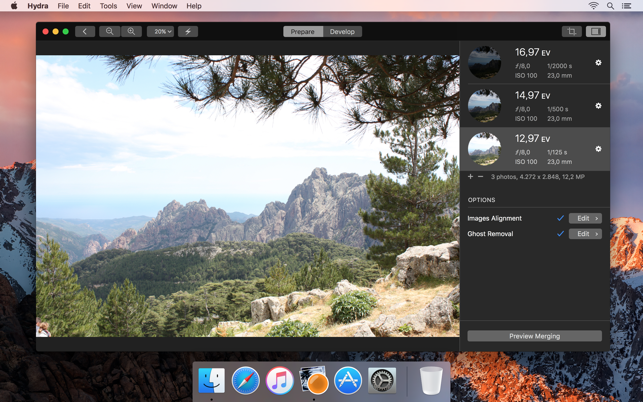 I run El Capitan OS X and I import pictures from a Canon 7D SLR. Hydra's imaging core is optimized for Metal. Metal is better supported in macOS Sierra than it is in El Capitan (which was the first release to include it). Depending on the model of your Mac, Metal might not be available at all, in which case Hydra falls back to OpenGL. About black image inputs: Hydra relies heavily on graphics card memory. A 7D processes photos at 18 megapixels. Depending on your Mac model, available graphics card memory, and whether it is compatible with Metal or falls back to GL, Hydra could produce this problem. There are possible solutions for this that we can try. If you could contact support again, and ask for Raphael. I'll try to see what's going on and have a workaround.